File this story under the “You’ve Been Warned” category. Frontier Airlines has carved out a place for itself by offering a unique “no frills” product that can come with surprises for the uninitiated. The following review, by Kimberly Grimes, a staffer at the San Francisco Chronicle, first appeared on Chris McGinnis’ TravelSkills blog at the papers SFGate website, and it clears up a few areas about the Frontier experience. Frontier has never been my first choice when it comes to airlines. I wasn’t purposefully avoiding Frontier, but I wasn’t really interested in flying with them either. However, when a friend’s parents invited me to go on vacation to Florida with them (and pay for my flight), I was curious to see what I would get from the ultra low cost carrier. 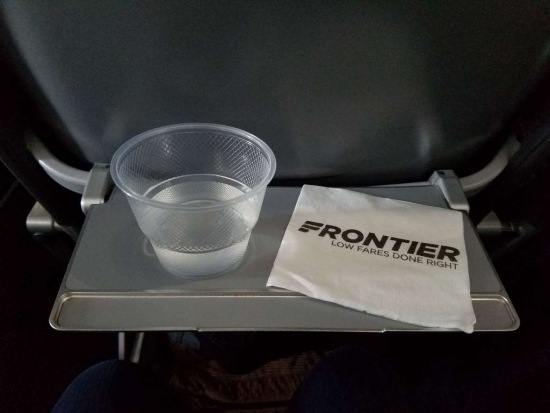 Earlier this year I flew Frontier roundtrip between San Francisco (SFO) and Orlando (MCO) nonstop and it wasn’t as bad as some people think. When booking a Frontier flight, the airline greatly encourages customers to choose and pay for seats for an extra fee. If seats are selected during the initial booking, the fee starts at $6 for a standard seat and $20 for “stretch” seating (economy class seats near the front of the plane with more legroom.) If you decide to buy seats during check-in, the minimum fee is $11 for a standard seat and $25 for stretch. But, if you’re okay with sitting anywhere, you don’t have to pay at all. If customers don’t choose to pay for seats by the end of check-in, Frontier automatically assigns them seats for free. They even try to keep the travel party together when possible. It’s a bit of a gamble, but waiting for Frontier to assign free seats can sometimes mean getting a better seat than those who have paid. Huh? Well, it seems that a lot of people aren’t willing to pay more for extra “stretch” legroom, which means that a flight can end up with several “stretch” seats still available by the time check-in starts. My friend and I tested our luck by checking in at the airport kiosk and being assigned to seats at the desk. We didn’t get those roomy stretch seats, but ended up with seats in row 9 for free while our other travel companions (who paid extra when making their reservation) had to sit back in row 28. As on most airlines, standard seats near the front of the plane cost more than the ones in the back, so we got a decent deal. On our return trip, we chose to check in online about 20 hours before our departure. We ended up with standard seats closer to the back of the plane, but we still got to sit together without paying the seat fee. Flights were 100% full in both directions. Frontier is one of the few airlines that charge a fee for carry on bags. If you’re traveling light, you can probably avoid paying Frontier’s hefty carry-on baggage fee by bringing a “personal item” instead. If you do bring a full sized carry on (10″ x 16″ x 24″) the fee is $30 (each way) if purchased during the initial booking. During online check-in this fee goes up to $40, and if you wait until you get to the gate, you’ll pay $45. I thought this fee was pretty expensive and knew immediately that I would not pay it. Instead, I decided to bring on the biggest bag that would qualify as my free personal item. Measurements for a personal item on Frontier are 8″ x 18″ x 14″. Collectively, this is only 10 inches less than the maximum measurements for a carry-on bag. Frontier suggests that personal items are typically small purses or neck pillows, but I knew that I could make my personal item function as my carry on. I took out my old corduroy Jansport backpack that I always travel with, stuffed it, and measured. It was perfect, just half an inch short of the maximum measurements for a personal item. When I boarded the plane, I carried on my backpack for free. It contained my laptop, charger, a battery pack, a change of clothes, tons of snacks, and my small purse (stuffed with all of the things I usually carry). This is what I carry on for most flights, so I was glad that I didn’t need to change my routine or pay extra to bring my backpack on Frontier. Water is the only food or beverage item that Frontier offers for free. There are no complimentary snacks or sodas. Just water. I didn’t know this for certain ahead of time, but I knew there wouldn’t be a hot meal service so I brought on a lot of snacks. If you want to purchase snacks on board, be prepared to pay: Frontier offers a variety such as Chex Mix, Almond M&M’s, and Pringles for $2.99 each. They also offer soft drinks, juices, and mixers for the same price. Wine, beer, and spirits are available for $7.99. Frontier offers several snack and drink bundles for passengers who really want to enjoy the snack service. These bundles offer a little bit of savings if you want to buy more than just a single snack and cater more towards families or passengers flying with a companion. One of the most indulgent bundles that offers big savings is the “double happy hour,” which includes four alcoholic beverages, two soft drinks or mixers, and two snacks for $29.99. Built for two, this bundle saves a total of $13.93. I was surprised to find that they also had bundles for children. These seemed to be the most reasonably priced to me. The Kid Fun Pack was $3.99 and included a snack stick, Goldfish, Oreo Cookies, M&Ms and a trading card. Flight attendants accept credit cards only for inflight purchases. 4. Forget about the tray tables. The seats on this Frontier Airlines Airbus are basically shells covered with thin padding. The tray tables could possibly support an iPad, but not a laptop. Good to know if you’re planning on working while on the flight. Bring plenty of your own entertainment on long Frontier flights (ours was about six hours) and be prepared for difficulties if you’re trying to pass the time by sleeping. On the way to Orlando, we took a red-eye flight and I needed to sleep, but this wasn’t the most comfortable flight for that. The seats did not recline (at all) and there wasn’t enough room for me to lean forward and rest on the tray table, so I ended up awkwardly slouching in my middle seat. (Seat pitch on Frontier’s Airbus planes is just 28 inches compared to the average of about 31 inches.) Nonetheless, I managed to sleep for most of the flight, but did not feel well rested when I woke up. On the return flight to SFO (a daylight flight), sleep wasn’t an option so I had to figure out how to entertain myself. Frontier doesn’t offer any in-flight entertainment or wi-fi. I saw a few people try to use their laptops offline, but with the tiny tray tables, most of them gave up. Passengers around me seemed to have the most success with books or tablets for entertainment. Neither of my Frontier flights were particularly eventful and it would’ve been incredibly boring if I didn’t have a book to read on my return flight. Frontier may be an ultra low-cost carrier, but it was a good airline option for me. I did some preparation ahead of time and got exactly what I expected out of my flights. One thing that stood out the most about Frontier was that everyone I encountered gave me excellent customer service and did their best to make sure I was comfortable. Flight attendants were very nice and tried to accommodate as many passengers as they could. I mention this because I’ve never seen so many passengers be confrontational with flight attendants as I did on this trip. It’s not unusual to see brief disputes about seating or overhead bin space, but on Frontier I saw countless passengers expecting flight attendants to provide them with services that they did not pay for. This ranged from passengers wanting to trade for better seats to people who harassed them over the price of in-flight snacks. After witnessing one of these uncomfortable incidents with a passenger prior to departure, I asked the flight attendant how she was doing. She smiled and told me honestly that she was tired and looking forward to resting after we landed. We joked around a little and she didn’t burden me with her feelings, but I couldn’t help but feel bad watching her do the safety demonstration with a strained smile. It became apparent to me that a lot of people jump at cheap fares on Frontier without fully understanding what they’re getting and what they’re not. It’s important for people to do their research before booking and make sure they’re okay with what they’re getting when buying a ticket. If Frontier doesn’t seem like a good fit, it’s probably worth it to spend a little more somewhere else to get the desired amenities.